Boost Your Power and Read Your Boost! Three power levels: STOCK, TOW, SPORT. 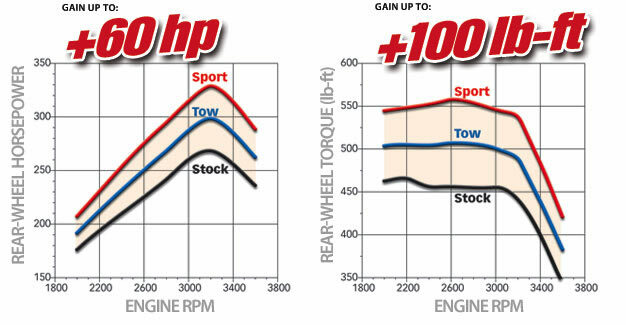 TOW adds about 30 hp; SPORT adds about 60 hp. Power adjustable on-the-fly. 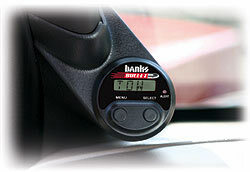 The Bullet is also a Digital Boost Gauge. A separate setting lets you select a boost level that will trigger the visual alarm (a red LED). Adjustable from 20-50 PSI in 1 PSI increments. Requires thermocouple upgrade. The optional thermocouple equips the Bullet with adjustable temp limiting control. Set the temp limit and save your engine! Fueling limits are adjustable from 800-1500� in 50� increments. Exceeding the set EGT limit by more than 50� will trigger the visual alarm. 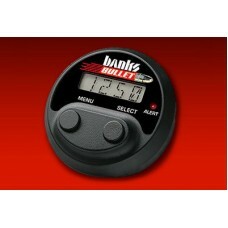 The size of a standard 2” gauge, Banks Bullet can mount anywhere a gauge can go. Includes a single-gauge instrument mounting panel. An optional pillar-mount console is available (shown). No Big Rig Diesel is Missing These Gauges; Why Should You?